Diwali Celebrations : Do You Know How Sikhs Celebrate Diwali? Diwali Celebrations – Let’s know How Sikhs Celebrate Diwali! Diwali-the festival of light, mirth, happiness and joyousness. It brings an air of festivities, new clothes, lamps and lanterns, sweets and many other things that add to the fervour of the occasion. India being the multi-cultural land it is, peaceful co-existence of all religions brings about an extremely vibrant array of festivals that the entire nation celebrates in harmony with each other. Similarly, Diwali is not exclusively a festival bound and limited specifically to the Hindus of the country. Diwali is one such festival that i.e. celebrated with equal enthusiasm by the Sikhs in India and all around the world. 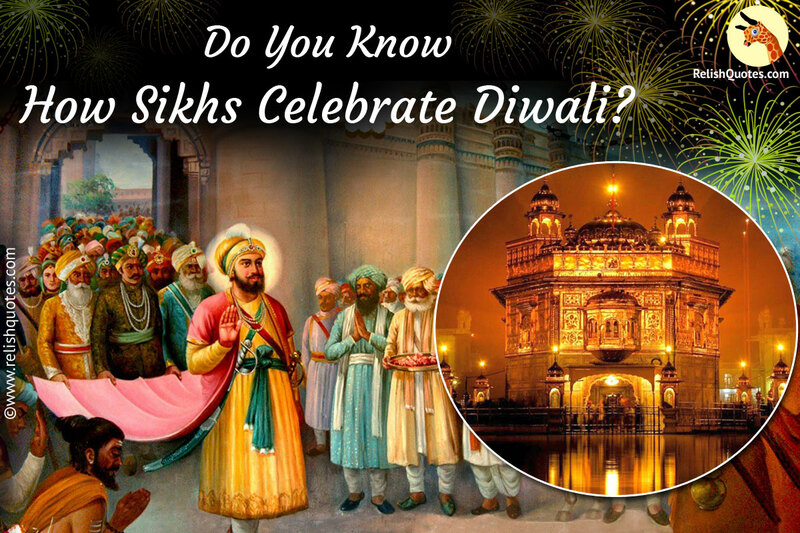 Diwali is of exclusive significance to the Sikhs as it is celebrated as the Bandi Chhor Diwas or the “Day of Liberation”. The word “bandi” means “prisoner” and “Chhor” means “set free”. This day marks the release of the sixth guru, Guru Hargobind Sahib ji from a fort in Gwalior, along with 52 other Hindu Kings, from the Mughal ruler Jehangir. During the reign of the 6th, Guru Sikhism was fast spreading its wings all around. Sadly, religious leaders and Mughal rulers of that era became highly jealous of the heights Sikhism was achieving. In order to trample the splendour of the Sikhs, Mughals ordered the Guru ji to be detained in the fort of Gwalior in the year 1619 AD. When Guru Ji, entered the premises of the Jail, other 52 Hindu kings warmly greeted Guru and showed due respect and reverence. These 52 Hindu kings owned provinces of the surrounding areas and their kingdoms had been acquired by the Mughal rulers after they had faced so many atrocities. Guru ji guided them with his words of wisdom telling them about hardships of life and asked the 52 kings to concentrate on Naam Simran. Jahangir was taken aback by the respect and wide acclaim Guru ji carried. With fearful visions troubling him, Mughal Sufi saint Mian Mir advised Jahangir to set Guru Ji free and following the advice of the wise, the Emperor gave the orders. But apart and high as he was, Guru Hargobind Ji refused to embrace freedom alone. He refused to leave the fort and demanded to set free the 52 innocent prisoners along him. The Mogul Emperor wanted to outsmart Guru Ji and kept a condition to liberate any and every prisoner that could get a grip on to the Guru’s clothing. So Guru Hargobind Sahib Ji used his wit, ordered a customised cloak that came attached with 52 tassels. 52 cloth pieces of varying lengths were then tied to each tassel. Each Hindu King got their hands one of these and easily came out of the Jail. Guru Ji’s followers were ecstatic and religious hymns have sung to honour the Guru. Guru Ji travelled to Harmandir Sahib (Golden Temple), Amritsar, on Diwali eve, in the company of the 52 Kings to receive blessings and celebrate the freedom. The Harmandir Sahib since then till today is beautifully lit like a jewellery box. Every Diwali it is decorated in every nook and corner and fireworks and sparklers adorn the sky. Since then Guru Hargobind Sahib Ji is called, “Liberator” and worldwide Sikhs celebrate Bandi Chhor Diwas with joy and happiness.